Though David Slater was born and raised in Toronto, he has become an adopted child of New Orleans, the city that has captured his heart. Slater didn’t always know he wanted to become a chef. He began by pursuing an undergraduate degree in Mass Communications and Psychology at FIU before enrolling in business school. When he realized it wasn’t the field for him, he decided to change course, and enrolled instead at the Florida Culinary Institute in West Palm Beach. After graduating, he began working the prestigious Windsor Court Hotel and Restaurant Cuvée kitchens in New Orleans. In 2001, he joined Emeril’s team, and never looked back. His first Emeril’s stint was at his namesake restaurant in Orlando. 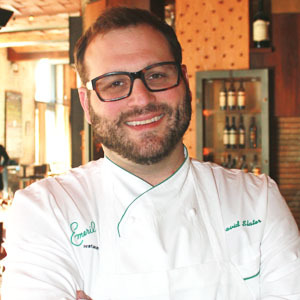 After gaining experience at both the Universal Studios and Atlanta locations, Slater returned to the Louisiana to work as Sous Chef at Emeril’s New Orleans. In 2008, he was promoted to Chef de Cuisine. At Emeril’s, Slater is serving up “New New Orleans” food with a nod to the worldly-cuisine he experienced as a child growing up in cosmopolitan Canada. Slater’s knack for incorporating local ingredients with bold, creative flavors has earned him a number of awards, accolades, and acknowledgements during his stint as Chef de Cuisine. He was named as one of the “Best Executive Chefs” by New Orleans CityBusiness in 2009, was featured in Food & Wine’s list of critic’s best recipes in 2010, earned Star Chef’s Rising Star Award in 2012, and landed Emeril’s New Orleans on the list of USA Today’s Best Farm-to-Table Movement Restaurants. "Chimichurri sauce is a green sauce made with herbs that is traditionally used as an Argentinean meat condiment, but is great on anything." Enhancing basic grits with roasted pumpkin purée adds a sweet and earthy boost of flavor. The creamy texture and rich flavor of homemade grits make a wonderful base for any meal. A Creole classic, this gumbo combines ham and fresh herbs to create a warm and flavorful one-pot dish.